America has become more productive by applying Lean Six Sigma principles to running businesses. The concept is simple. Find the things that need to be done and are effective, and remove every other unnecessary step and cost from the process. Now we have evidence that a lean approach works in managing medical treatment for work injuries. The approach stands conventional medical management on its head. Less is more. That is, less unnecessary case management, physician review, bill review, and the entire scope of medical management services. A recent WCIRB report (PDF) shows that, although recent changes in California have controlled medical costs, the costs of managing the programs – or Allocated Loss Adjustment Expenses (ALAE) – have skyrocketed by 24% since 2012. Every intervention and, therefore, cost is not needed. But how do we determine when the effort is just a cost, and when it is needed and adds value? The key is very targeted medical interventions in claims, guided by continuous data detection around risk factors. Specific, real-time course corrections to medical care cut both losses and claims “overhead.” Case management, done when and just for how long it is needed, is better. We discovered this by applying a lean approach with our clients to tens of thousands of workers’ compensation claims and closely tracking the outcomes for the past four years. What we found is the approach, aided significantly by analytics, reduces the number of field case management interventions in lost-time claims by roughly one third, cuts medical management service billings by roughly the same rate, and drives down disability durations by over two months on all claims. Most work injuries resolve without much of any problem. A smaller percentage of claims fail to resolve as expected, resulting in much higher wage replacement and medical costs. They also incur far higher claims overhead in the form of peer reviews, bill review, case management and other expenses typically assigned to ALAE, with the majority of these intervention costs occurring after the first 6 months. To be sure, some injuries with complex medical issues need extensive intervention, such as field case management and IMEs. However, the great majority of claims that “go bad” could be saved from “going bad” with focused early intervention, continuous use of analytics to gauge risk, and removal of barriers that arise at precise moments. What are these precise moments? In the box below, you will find some requests we receive from both injured workers and adjusters during the course of recovery. Every reader will recognize these queries; they don’t seem particularly momentous. But if you have been using analytics to identify high risk cases, you find that small impediments can trigger a cascade of problems for these case types, such as litigation, leading to literally hundreds of thousands of dollars in claims costs and a piling up of ALAE. The seemingly routine problems listed below can derail medical recovery of higher risk workers if they are not resolved promptly by a medically-informed resource. Help me understand what I am supposed to do. Can you help with setting up transportation? My doctor wants me to see a specialist, can you help me find one? I am having issues with filling my prescriptions, can you help? I forget who I am supposed to be seeing for physical therapy? This claim just came in today and I need a rush request on finding a provider in the Orlando area, his employer thinks he may have a tendon rupture. This patient just let me know that the specialist we set her up with cancelled the appointment and they can’t reschedule for three weeks – can you speed this up? The employer is willing to return this patient back to work, but the physician’s release must contain the following information – can you coordinate getting this? Through careful data analysis, we have, in effect, documented how “creeping catastrophics” happen. First, the injured worker is at a higher risk of failed recovery, even if the claim may appear ordinary. Second, one or a number of events occur that create a barrier to going forward. The cure is to find the high risk cases, move them to a good path early, remove any barrier(s) that arise rapidly, and remain watchful. This is an event-driven, course correction model. Comparisons with conventional medical management show that a lean, event-driven system results in fewer medical encounters, substantially less case management, less litigation, shorter claim durations, and lower total direct and allocated costs. Stepping back, we can see how analytics are changing the landscape of American life with course corrections and service levels that ten years ago would be considered miraculous. For example, consider trip navigation systems. Mobile phone maps were amazing when they first came out. Today, phone applications like Waze collect real time, crowd-sourced traffic data to continuously and cost-effectively monitor and alter routing suggestions. Similarly, companies are now pairing data analytics with expert individuals to deliver course corrections and higher levels of outcomes in disease management, public safety, construction projects, financial underwriting – the uses are virtually endless. Traditional industry methods result in ALAE medical management costs that are much higher than they should be. The good news for claims payers is they can use lean principles to reverse a 25 year trend in ever-increasing ALAE expenses. In my next article, I’ll outline how a lean strategy works and describe how claims payers can transition from a current state of excessive expenses. 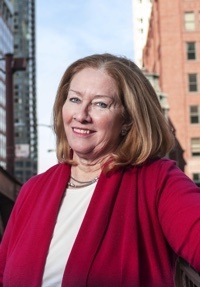 Anne Kirby is the chief compliance officer and vice president of care management at Rising Medical Solutions (Rising). She has 30-plus years of industry experience, spending most of her career developing and delivering managed care services, as well as creating technology platforms and data analytic tools to enhance program performance. At Rising, Anne leads the company’s medical care management operations, and its regulatory, legal and quality management initiatives. She has also been instrumental in developing the company’s analytics and risk scoring capabilities in order to drive optimal claim outcomes. Anne can be reached at anne.kirby@risingms.com. Rising Medical Solutions (www.risingms.com) is a national medical-financial solutions firm that provides medical cost containment and medical care management services to the workers’ compensation, auto, liability, and group health markets.